Young Investigator Award finalist Imtiaz Ahmed, MD, a fellow in Neonatal-Perinatal Medicine, left, discusses a poster presentation at Pediatric Research Day. Researchers and caregivers from Penn State College of Medicine and the community gathered to discuss “How the environmental becomes the biological” at the 10th Pediatric Research Day on March 13 at Hershey Lodge. Penn State Children’s Hospital hosted the event. “The idea of research day is to spark new ideas, generate new collaborations and make new connections,” co-organizer Dr. Carrie Daymont said. 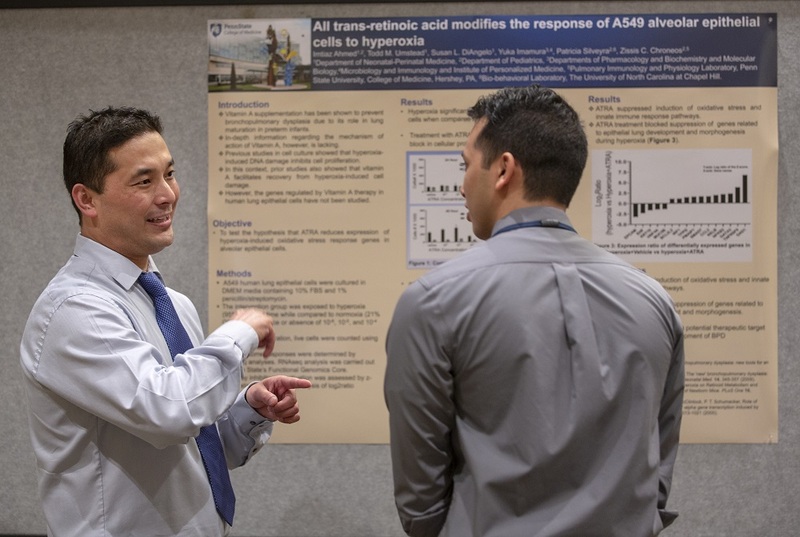 Investigators ranging from graduate students to fellows gathered with faculty and providers to encourage each other to continue in their research endeavors. The afternoon began with poster presentations of research aimed at improving the health of children. Researchers presented almost 60 abstracts representing work from surgery to depression to the basic sciences. Imtiaz Ahmed, a neonatal-perinatal medicine fellow, and his colleagues examined how the active metabolite of Vitamin A could be a potential therapeutic for bronchopulmonary dysplasia in preterm infants. Tracey Harris, a neonatal-perinatal medicine fellow, and her team investigated how genetic variants in a protein might affect the risks of infection during NICU hospitalization. Kashish Mehra, a neonatal-perinatal medicine fellow, and his team studied how the use of a certain mode of ventilation in recent years has affected the trends of bronchopulmonary dysplasia. Carson Wills, an MD/PhD candidate, and her colleagues researched how extracellular vesicles regulate the growth and metastasis of neuroblastoma, a common pediatric malignancy. Patricia Yee, an MD/PhD candidate, and her team studied how the hyperactivity of a transcriptional coactivator contributes to distortion of the immune tumor microenvironment, differentiation and progression in glioblastomas, the most prevalent and deadly form of brain malignancy. Steve Cole, professor of medicine at the David Geffen School of Medicine at the University of California, Los Angeles, and Dr. Heather Burris, an assistant professor of pediatrics at the University of Pennsylvania Perelman School of Medicine were the invited speakers. Their presentations focused on how environmental and social factors can influence health outcomes. Tracey Harris and Carson Wills were named runner-up and winner, respectively, of the Young Investigator Awards at the conclusion of the event. Deciding the winner was difficult, said event co-organizer Dr. Valerie Brown, and that means the future of pediatric research is bright. “Three of our finalists were fellows,” Brown said. “Research isn’t their everyday activity, and to see them making time to do this gives us hope.” She also noted that the commitment of faculty and providers to make time to attend the event represents a commitment to ongoing pediatric research and care. 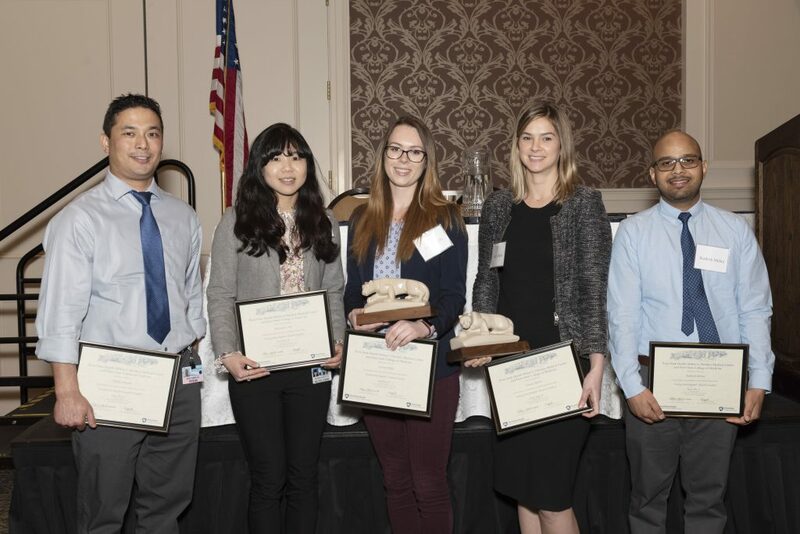 Finalists for the Young Investigator Award at Pediatric Research Day 2019 are, from left, Imtiaz Ahmed, MD, fellow in Neonatal-Perinatal Medicine; Patricia Yee, MD/PhD student; Carson Wills, MD/PhD student (winner); Tracey Harris, MD, fellow in Neonatal-Perinatal Medicine; and Kashish Mehra, MBBS, fellow in Neonatal-Perinatal Medicine.